WASHINGTON—In response to public outcry over his recent controversial press conference with Russian president Vladimir Putin, Senate leaders cautioned Tuesday that it was far too early to discuss Trump. 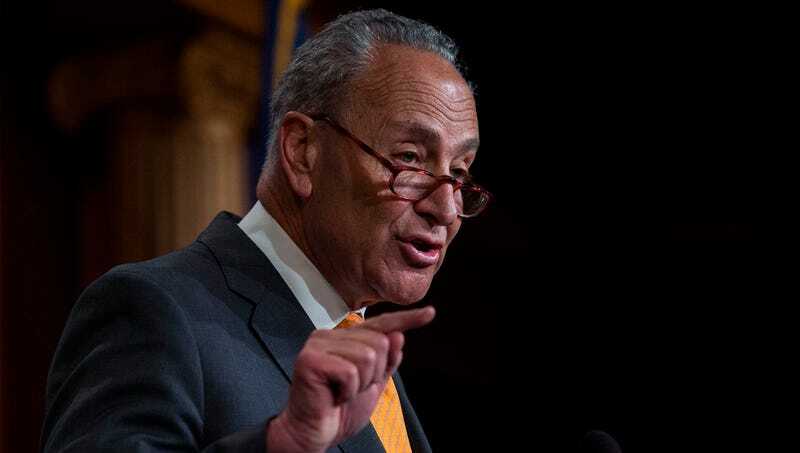 “We understand that many Americans may not agree with everything the president says, but these calls for the Senate to start conversing or thinking about Trump are entirely premature,” said Senator Chuck Schumer (D-NY), echoing sentiments from fellow Democratic leaders and several Republicans that it would be rash and self-defeating to bring up Trump in the Senate without ample reason to do so. “We’re aware that a few members of the House of Representatives have initiated proceedings to raise the idea of Trump, but what activists and left-leaning politicians need to remember is that impulsively throwing around the concept of Trump will likely do much more harm than good. At this point, there’s just no evidence that we should mention the word ‘Trump’ in the Senate at all.” Schumer also warned that historical precedent had revealed there was very little benefit to be gained from discussing a sitting president in an election year.